To anyone familiar with Hemingway’s prose, the first three rules will come as no surprise. However, the fourth might give the reader pause, insofar as it connotes an intentionally optimistic outlook. Was the author of A Farewell to Arms promoting the power of positive thinking? Was Papa urging us to put on a happy face? Probably not. What Hemingway was advising us to do, at least as writers, was rather more technical than that. He was admonishing the writer to pay attention to what is present, not what is absent, and to render the present reality in the most direct way. Don’t say that a stomach cramp is less than pleasant. Say that it hurts. 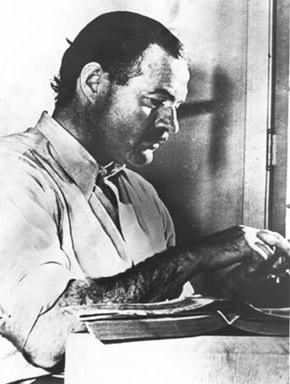 Ernest Hemingway was not a Zen practitioner, but by and large, Zen teachings accord with his rules. Zen is famously a practice of few words—or none at all. And the heart of the practice is mindfulness, which Zen master Thich Nhat Hanh defines as being present for the present moment. Practicing seated meditation, we do not focus on what is missing in our immediate experience. We attend to what is present, be it a physical sensation, a transitory feeling, a passing thought, or a state of mind. And time and again we return to our breathing, which is unmistakably present and brings us back to the present moment. For some practitioners, the use of minimal language (“in/out,” “deep/slow”) serves to support the practice of conscious breathing. Yet, as Hemingway well knew, the English language runs athwart the purpose of being positive, abounding as it does in negative nouns and verbs, prefixes and suffixes, adjectives and adverbs. Most words ending in “-less” (homeless, speechless, clueless) describe an absence, as do words beginning with “in” or “un” (inarticulate, insubstantial, unwholesome, unprepossessing). Beyond that, rhetorical devices such as litotes, a form of understatement that indicates what is not there (“I’m not partial to Brussels sprouts”) and antithesis (“I had a wonderful evening,” quipped Groucho Marx, “but this wasn’t it”), call attention to what is missing. Most conspicuously, the subjunctive mood (“had we but world enough, and time”), tempts us at every turn to state what might have been, or might yet be, rather than what is. As with human language, so with the human mind. “Is it just that humans are wired,” asks Roshi John Sutherland, “to yearn for the thing that isn’t there?”* The answer is almost certainly yes, whether the object of attention be our selves or the world at large. Who among us hasn’t looked in the mirror and noted a shortfall or two? And given the present state of the world economy, the unending violence in unstable foreign nations, and our own dysfunctional government here at home, who can be blamed for focusing on what is lacking rather than what is present? If we are indeed to be positive, both in Hemingway’s sense and in the more conventional sense of being optimistic, how should we go about it? Where should we look for enabling models? One place might be James Joyce’s Dubliners (1914), a pivotal work in Hemingway’s development and the primary model for his debut collection of stories, In Our Time (1925). In his pioneering work Joyce set out to portray the moral, emotional, and spiritual “paralysis” of Great Britain’s second city. To that end he employed what he called a “scrupulous meanness” of style, void of verbal excess. Focusing, respectively, on childhood, adolescence, maturity, and public life, Joyce depicted repressed, lower-middle-class lives, straitened by economic hardship, constrained by a narrow nationalism, and oppressed by a culpable religious hierarchy. Yet if Joyce’s style and content are largely negative, his stories’ impact is quite the opposite. Their extraordinary concentration and economy of means have a bracing effect, leaving the reader feeling more exhilarated than depressed. Their realism is life-affirming. Much the same might be said of Zen meditation, which also brings a concentrated mind to bear upon realities, some of them unpleasant. Sitting still for forty minutes or more, we become intimate with our memories, fears, fantasies, and expectations, our habitual judgments of ourselves and others. We may also meet what Carl Jung called our “shadow” self, the one we hide from the world. Such encounters can be disturbing, but if we are paying close attention, we may also notice that what we are encountering is, in the language of Zen, empty of a separate self. It arises, abides, and dissipates, like contrails in the sky. And if we sit for days on end, as happens in a meditative retreat, we may also discover that facing realities feels better than the alternative. It tests our moral strength, and it reminds us, concretely and irrefutably, that we are alive, in flux, and inextricably connected to other living beings. I know of no surer way of being positive. *Joan Sutherland, “The Whole Way,” The Best Buddhist Writing 2010, ed. Melvin McLeod, Kindle edition, 25. This is a lovely post, Ben. I’ll never forget the first Hemingway book I read (For whom the bell) – how stunned I was that someone could write that way and convey such emotional power. Such a concentrated experience out of ordinary words! Thanks for visiting, and thanks for your comments.